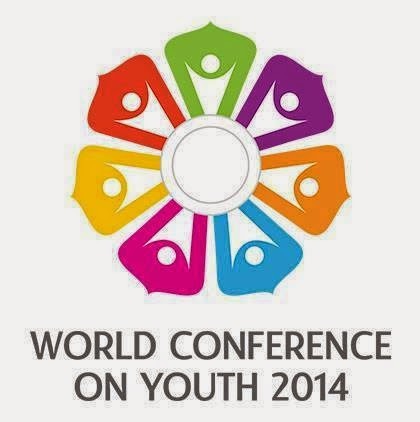 The World Conference on Youth 2014, (@WCY_2014 - #WCY2014) was scheduled from 6-10 May, 2014 and has ended today, Saturday 10th of May in Colombo, Sri Lanka. The Conference brought together about 1,500 young people, youth leaders, development experts, UN agencies, intergovernmental organizations, national delegations, National Youth Councils and other youth bodies, act to debate about the theme ‘’Mainstreaming Youth in the Post-2015 Development Agenda’’. The conference had a unique aim of producing a joint outcome document between states and youth called the "Colombo Action Plan". The Conference participants were half young people, and many of them coming from marginalised backgrounds, making the conference one of the most well represented youth events at the global level. The pre-conference process was led by an independent International Youth Task Force which represented major global youth organizations and regional platforms ensuring regional and gender balance. The Conference which took place at Bandaranaike Memorial International Conference Hall in Colombo invited world countries to select and send two official youth delegates to represent their National Youth Councils and other youth bodies. In addition to this, 350 more young people belonging to under-represented groups were selected by the International Youth Task Force. Furthermore over 100 youth delegates from Sri Lankan were selected and the Government of Sri Lanka has sponsored all young people attending the conference. Contribute to the establishment of a permanent youth engagement mechanism that ensures consistent follow- up with young people and further boosts their participation and partnership in the implementation of the post-2015 development agenda at national, regional and global levels. Priorities of young people for the Post-2015 Development Agenda. Many side events and parallel events took place at the Conference. On Thursday 8 May, the Commonwealth Secretariat, and its partners including UNFPA Sri Lanka, Restless Development and the Ministry of Youth Affairs & Skills Development, Government of Sri Lanka, hosted a side event to discuss ‘’The Big Open Debate’’ on ‘’Should there be a stand-alone youth goal in the Post 2015 development framework?’’. Highlighting that globally, 87% of young people aged 15-24 years live in a developing context, the Commonwealth Secretariat encouraged delegates at the Conference to debate if there should there be a stand-alone youth goal in the Post 2015 developing framework. A campaign called #Yes2YouthGoal was launched prior to the event and knew a huge world mobilization, showing how young people globally agree with the idea of having a #YouthGoal in the #Post2015.